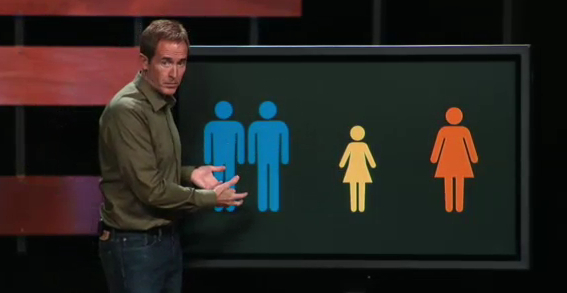 Is This Andy Stanley’s Gay Affirming Shot Across the Bow? I grew up in Charles Stanley’s First Baptist Church of Atlanta. When his son, Andy, became a pastor I was excited that Atlanta would have another Biblically solid pastor. However, it seems that may unfortunately no longer be the case. Christine Pack posted this article on her blog Solasisters.com describing how Andy Stanley recently gave a talk at his Buckhead Church, wherein he described a married man who had left his wife to pursue a gay relationship with another man. Stanley tells how the man wanted to get involved in the leadership of the church, but he had not yet divorced his wife. Stanley said in light of the fact that he was committing adultery, he couldn’t be allowed a leadership position in the church. However, he said nothing indicating that his active homosexual lifestyle should prevent him from holding a leadership position. He said that if the man would only divorce his wife, then everything would be fine. So apparently, adultery is out in his book, but an active homosexual lifestyle is okay. In the 18th century, a seafaring military action known as a “shot across the bow” began to come into common usage. This was a term used to describe a shot fired by one ship across the bow of an opposing ship to signal future confrontations. The shot was not meant to actually make contact, it was merely a warning signal that there were future confrontations to come from the firing ship. The obvious questions have to be asked: Is it even possible to frame up the scenario presented by Stanley (in which 2 – count them, 2 – marriages were blown sky high) in a way that makes sense unless a clear call for repentance is given? And yet, according to the Christian Post’s article on the final sermon of this series, Stanley completely sidestepped the issue of homosexuality in this series. The inescapable impression left by the account was that the sin of concern was adultery, but not homosexuality. Stanley clearly and repeatedly stressed the sin of adultery, but then left the reality of the homosexual relationship between the two men unaddressed as sin. To the contrary, he seemed to normalize their relationship. They would be allowed to serve on the host team if both were divorced. The moral status of their relationship seemed to be questioned only in terms of adultery, with no moral judgment on their homosexuality. Was this intended as a salvo of sorts? The story was so well told and the message so well constructed that there can be little doubt of its meaning. Does this signal the normalization of homosexuality at North Point Community Church? This hardly seems possible, but it appeared to be the implication of the message. Given the volatility of this issue, ambiguity will be replaced by clarity one way or the other, and likely sooner than later. Another false prophet has come out of the closet! Yes, I have just watched the sermon and also noted it had been edited. Previously I had followed the controversy by reading all the articles and commentary etc – but decided that I needed to watch the whole sermon – but there is now NO illustration. On another front, when we talk of God’s love and Him not condemning us, surely it has to be in the context of faith and repentance…. but Andy doesn’t mention those words. In fact, at the conclusion of the message, he says God says to people, ‘if you don’t [leave your life of sin], I love you’. ‘If you won’t [leave your life of sin], I love you’. But don’t we have to present the full gospel, with the need for repentance? I just finished watching the entire 8 part series “Christian” on North Point Community Church’s website; and what I find most remarkable is that this entire gay couple illustration does not appear in any of the segments. In fact Session 5 has apparently undergone severe editing as it is a full 5 minutes shorter than the next shortest session at 30:59. Most of the sessions are around 40 minutes in length. WHY? If he got it right the first time, then why edit it out now? Or is it that he is feeling the pressure from other Christian leaders and organizations to reconsider his position? Clearly, to acknowledge the adultery issue as a problem yet to give a pass on the fact of homosexuality is unconscionable. Worse yet, to give it a pass that qualifies for leadership is even worse. No doubt brother Andy is allowing his love for others to override either his understanding of scripture or his courage to call sin by its rightful name, “sin”. What is most amazing is that he goes into extensive detail in an earlier session, drawing upon the book of Corinthians to discuss how the young man who was having sexual relations with his step-mother was dealt with. His point being that “Inside the church” we need to pass judgement on sin, but outside the church we need to extend the hand of love. To which point I agree. But, from reading the facts surrounding this now edited out illustration of the “modern family” he appears to have forgotten his own lesson from just a few weeks prior? The saddest part is that otherwise, the entire series was GREAT! It was very, very articulate and I feel was a much needed push back against the war on doctrine that so often seems to divide God’s people and offends those outside the church. Certainly, if we could learn to walk in love, as Jesus demonstrated it, we would truly be the salt and light he called us to be. However, loving someone who is caught up in sin, just as they are, where they are is not the same as allowing them to serve as representatives of the church. We pray for alcoholics to be delivered from their sin. But, we don’t ask them to be usher and allow them to calmly nip while greeting at the front door! Andy Stanley’s concern was for the APPEARANCE of adultery, but not the real thing. Jude 1:7 calls the sin of Sodom “fornication”, not adultery. Most Christians don’t cross reference the teachings of Jesus, and the other New Testament authors, with the Law and prophets. If you don’t you will never get it! The New Testament was written in the context of the Old Testament! In reading these stories about Andy Stanley on the internet I was struck by how many times the articles said something like, “this brings up questions” as to where he really stands. I’ve found that when a pastor has solid Biblical beliefs about things like this – you almost never have to question it. They usually make it pretty clear where they stand. When a pastor makes it unclear or leaves a lot of questions – then one thing is clear – he doesn’t want to be clear about where he stands because he knows Biblical Christians won’t put up with it and they’ll leave the church. So Stanley did what all these guys do – he couched his acceptance of homosexuality as a non-sin in words that shrouded his real views in a cloud of mystery. Whenever a pastor does that – it’s a sure thing that he is taking an unbiblical view. There’s clearly no question about where Stanley really stands.